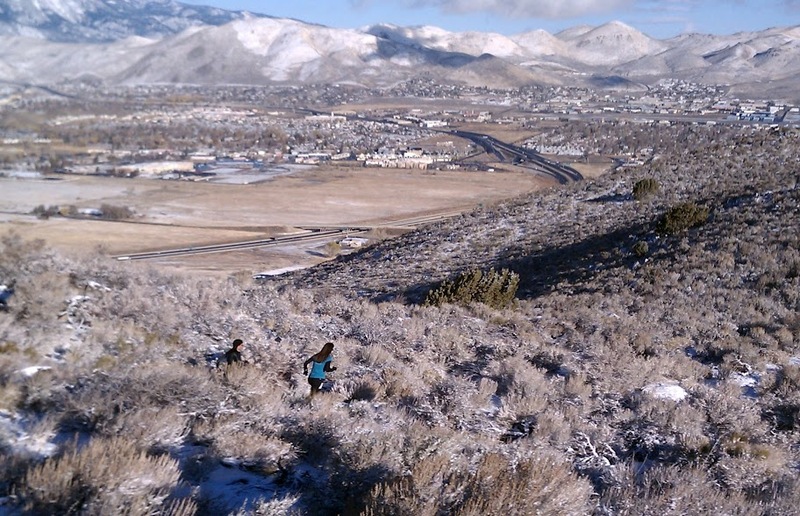 Yesterday morning came early with about an inch of snow here in Reno, although none of it stuck to the roads. 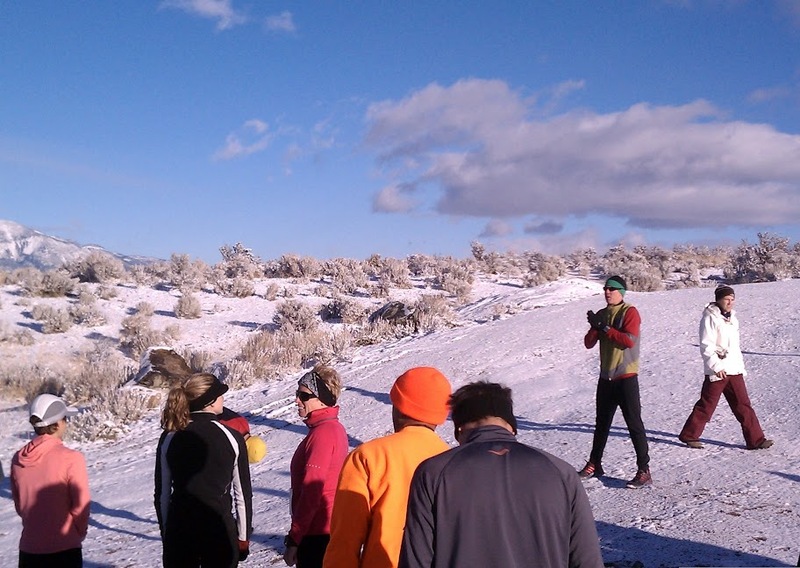 Nonetheless, it was a bit of a slippery drive down to Carson city for the Cold Turkey Run, the first in the Winter Trail Series. My wife and kids dropped me off at the start, and went and hung out with the grandparents while I was running. For some reason, it hadn't even occurred to me to think about what the course would be like. 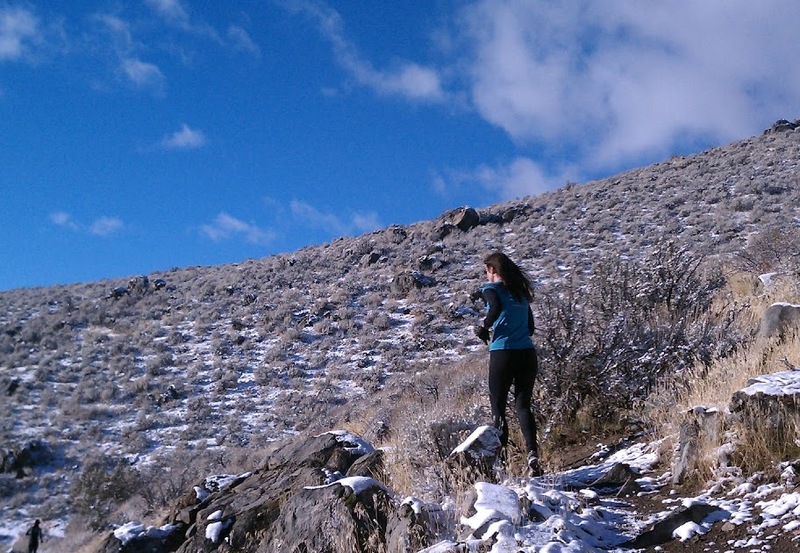 I had just thought "four mile trail run, no problem." I should have realized that this was pretty much all on the Escape from Prison Hill course - but with a bit of a climb to get up to it! Seriously, the first mile and a half was a 625 foot climb. I had to resort to my long-legged uphill walking pace more than a few times. Had a bit of an issue with my Garmin somewhere in here - the GPS stopped recording right at the two mile mark. Later, I figured out what had happened - my long-sleeve t-shirt had triggered the bezel, getting into the GPS menu and setting the GPS to OFF. Guess I'll have to start locking the bezel now when I'm running with a long-sleeve shirt. At any rate, I now unfortunately don't have a course map or elevation profile to show you. Got the first two miles, at least - with the time data from the whole course. Maybe next year. We finally crested the hill and retraced our route back down. I had to put the camera away then, because while the footing wasn't too bad, you really had to pay attention between the snow and rocks and stuff. Pounded back down to the start area in just under 45:00. I wanted to get a bit of a longer run in, so after milling around and having some water, I headed out to run to my in-laws house on the other side of Carson. It was still a beautiful morning, and after about 5.5 miles, I reached their house. A few of the other runners that were training for a the Death Valley Marathon headed out south to add some more miles to their days. 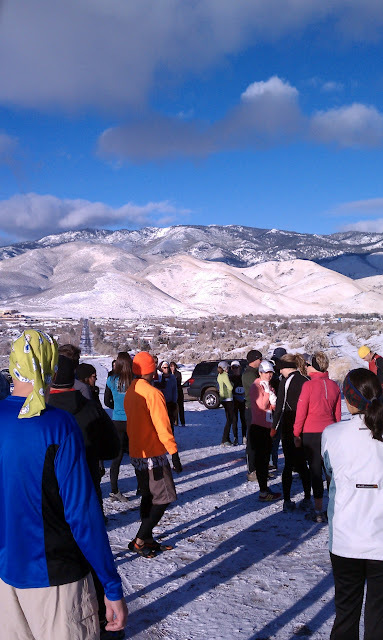 So, a really fun race and a great start to the Winter Trail Series. 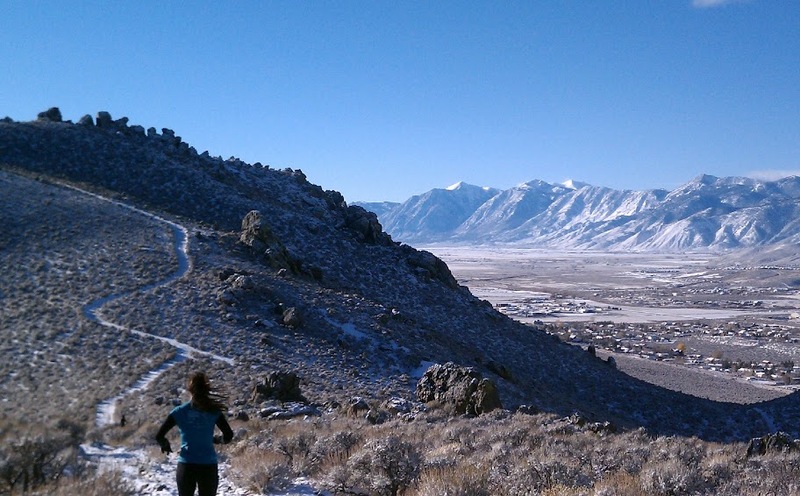 I hope to get down to most of these, to run with a bunch of cool people and learn some more of the trails around Carson City. 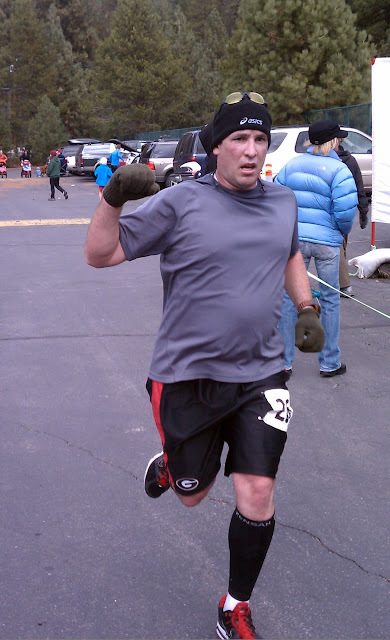 Thanks to Ascent Physical Therapy and everyone else who was out there putting this on - it was a blast. I'd only run this race last year, and then they'd switched the course around to run counter-clockwise because of some icy conditions. this year they ran it the regular way, which put the hilly section first, and ended with a flat 3.5 miles heading back west to the beach. I pushed a little on the hills, and felt pretty good. 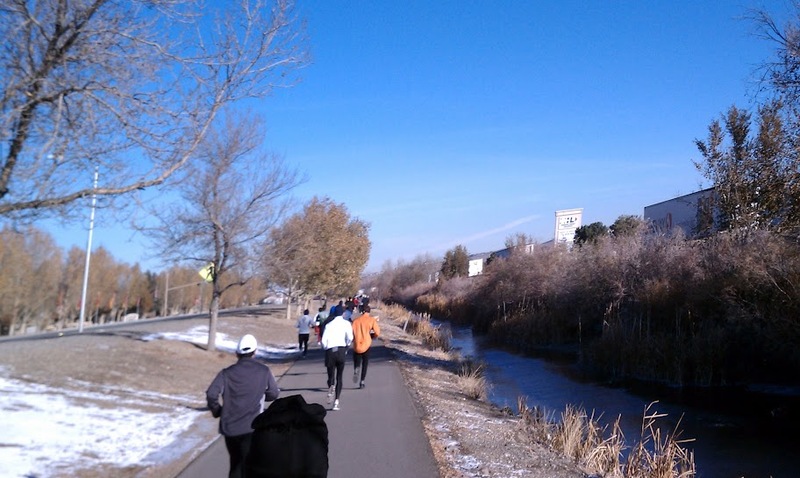 After looping through the park at the east end of the lake, I fell in behind a fast older guy with a dog. I tried to stick with his pace, and ended up staying with him right until the finish, with a time of 53:30 - knocking about 4 minutes off last year's time. Oh, funny thing about this race - I forgot my Garmin at home, and did the while thing pretty blind as to pace or timing, just on feel. 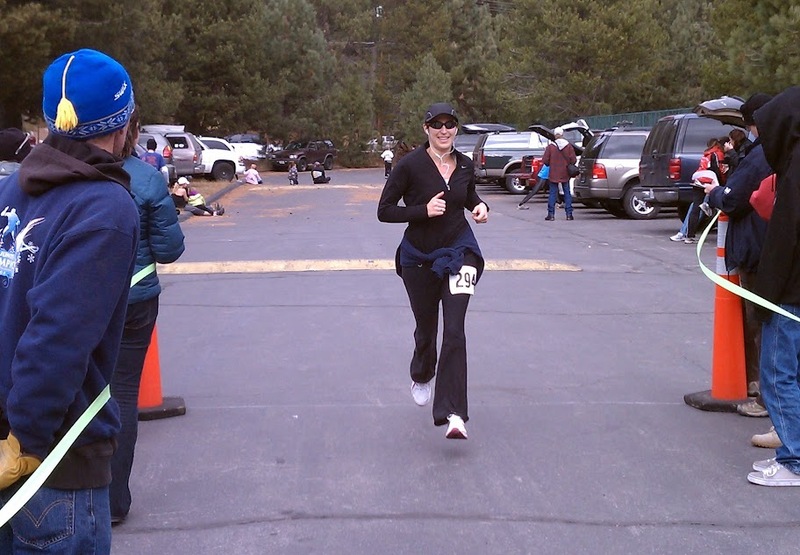 Kind of a fun way to run for a change, but of course I don't have any pretty graphics of the course to put up here. We then called Gretchen to meet us over at FiftyFifty Brewing on the other side of town for lunch. Might have to find a new post race spot - despite being nice people, having good food and some pretty decent beers, we've had terrible luck with the service there. Lunch today was just a waiting game, and I ended up eating late enough that I'm not gonna be hungry for dinner. But all in all, a great day out racing. Thanks everyone! 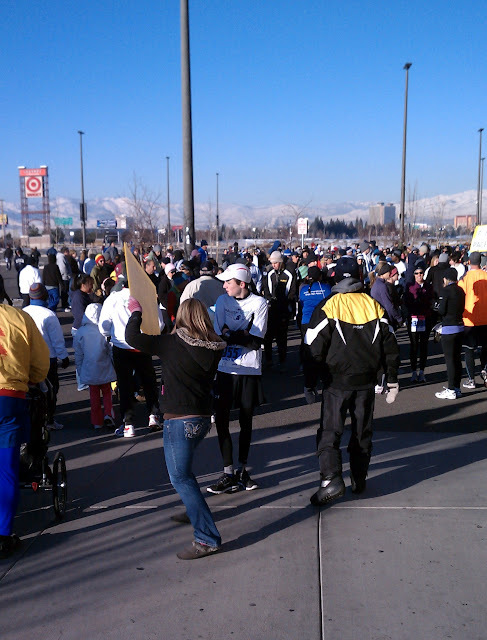 Tis the season for Turkey Trots! A few good ones coming up around here in the next couple weeks. 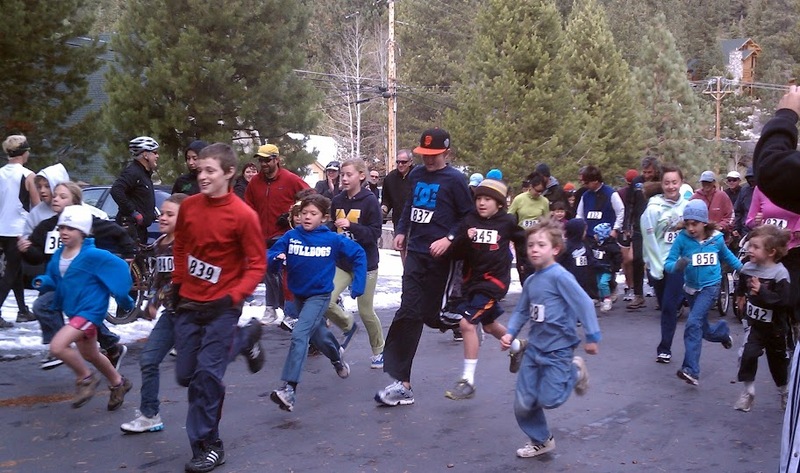 Coming up first, this Sunday the 14th, is the Donner Lake Turkey Trot. Team Library Dork made a good showing at this race last year, and I like the small-race atmosphere. Interesting distance, too - a 7-mile loop around the lake. At least a couple of us should show up for it this year. 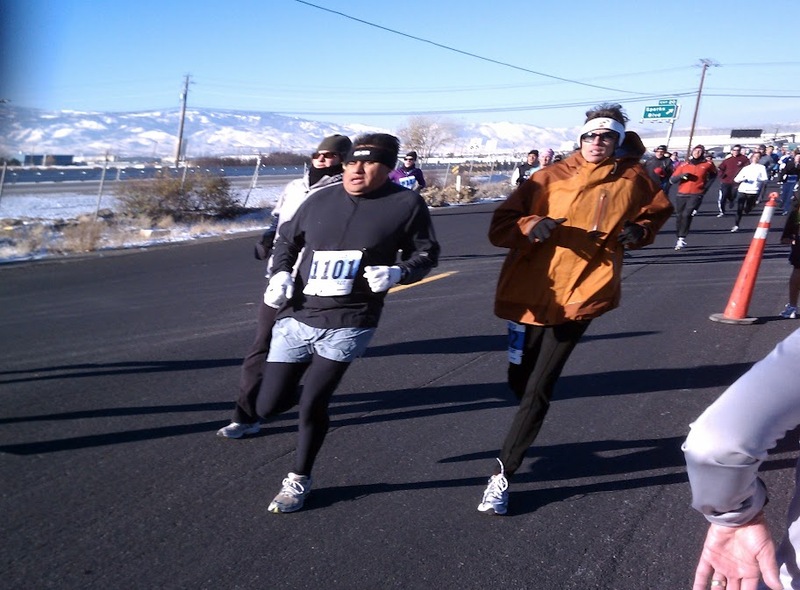 The Saturday after that, the 20th, is the Cold Turkey Run in Carson City - a 4-mile trail race. 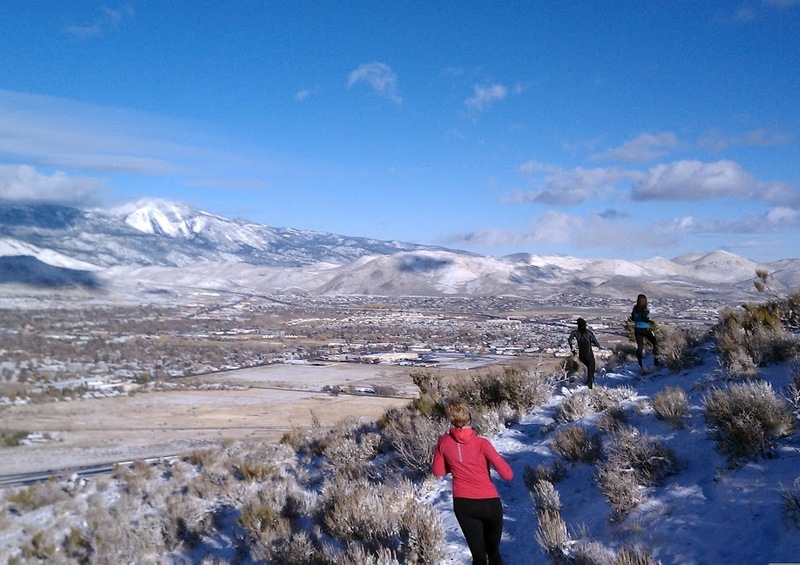 This is the first run in the Winter Trail Series in Carson, put on by Ascent Physical Therapy. 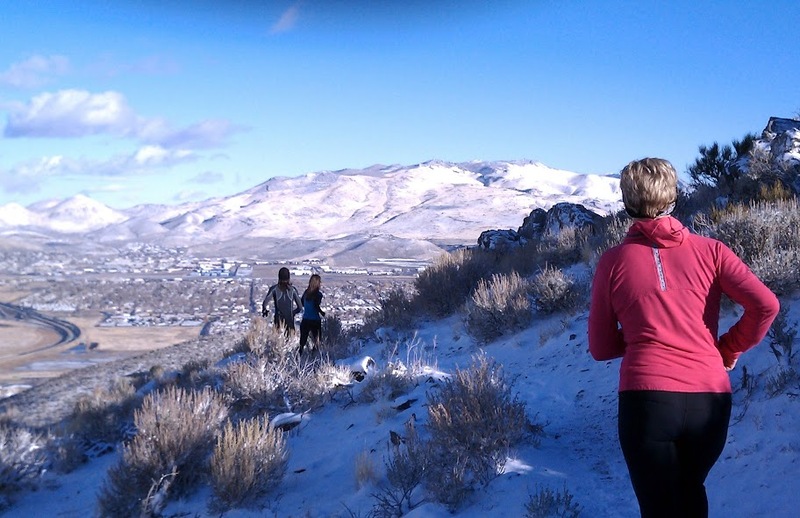 Some of the Carson City Runners that I ran with last weekend turned me on to this series, and it sounds like a good deal, and pretty fun. I have a PDF of the race info and registration, and I've put it on the race calendar, but I can't find where it's available online. So, if you're interested, I can send info, or contact Ascent at the link above. 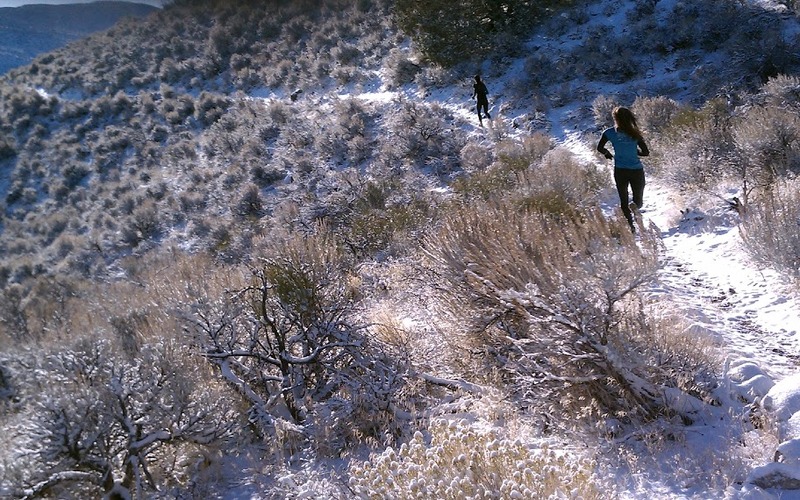 The forms are available on the "Race Training Groups" page at Ascent's website. 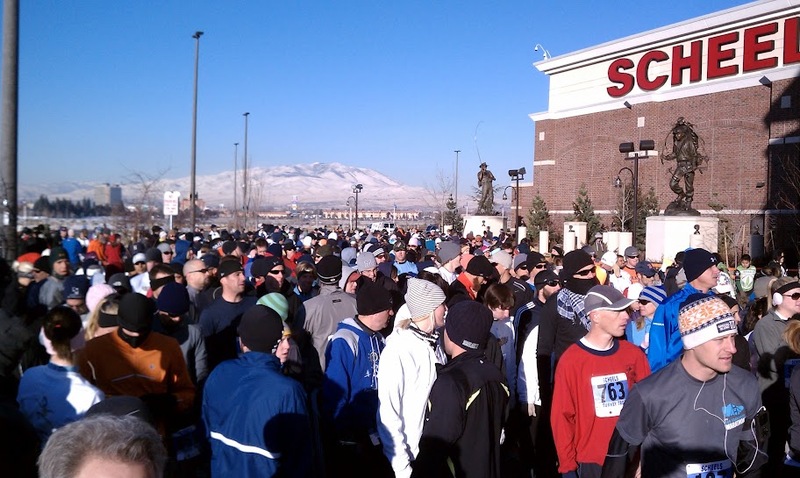 The BIG Turkey Trot around here is, of course, the Sparks event - now apparently called the Scheels Turkey Trot. It looks like they've retained the same "wings" logo and the sweatshirt giveaway, but have moved the course slightly to the Legends parking lot in front of Scheels. I previewed the course a couple weeks ago at the Spark-a-delic 10K.) Much bigger turnout here than those other two races - So lots of walkers to dodge and people to chase. But it's usually a big, fun party. Hope to see people out at some of these! 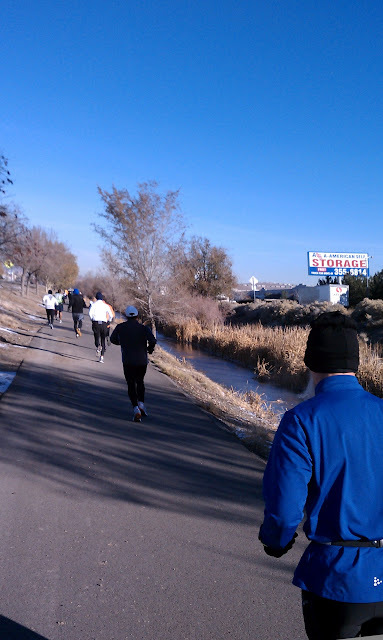 So, last Sunday I did get out and spend my free Daylight Saving Time hour (and then some) running. 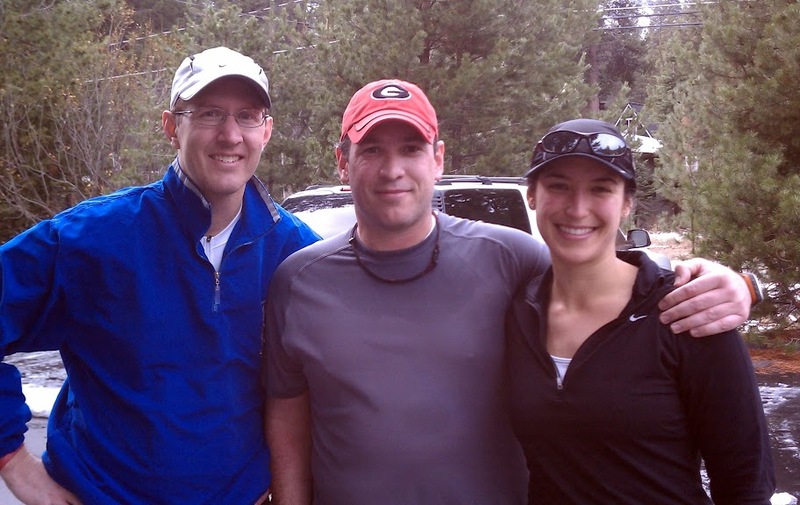 Team Library Dork met up with the Carson City Runners in Galena, at the Fall Colors Half Marathon course. Some people who were training for a trail marathon wanted to get a 13 mile day in, while others did a shorter hilly out-and-back. Weather was chilly and drizzly, but in never rained as hard as it had during the actual race a few weeks earlier. 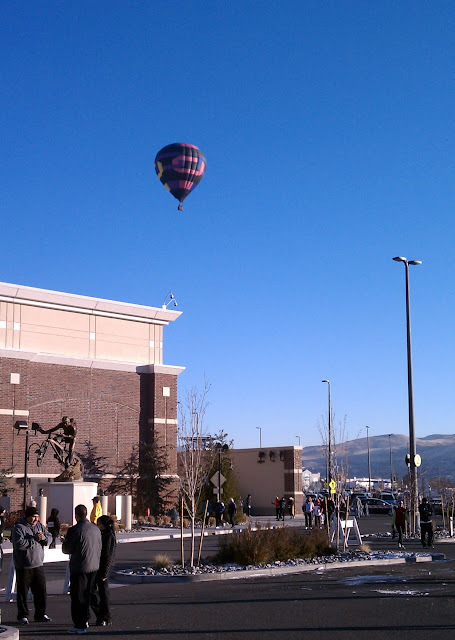 Here are a few pictures from the run, there are a bunch more at Picasa. Fall is my favorite time of the year - crisp temps, sweatshirt-and-shorts weather, changing colors, the hint of snow in the air. Of course, some people's favorite part of the season is that extra hour they get to spend in bed on the weekend that Daylight Saving Time ends. Seriously, if you're reading this, you probably would rather be out there running anyway, so consider this a challenge: Try to get out there for the whole hour that we're "falling" back. 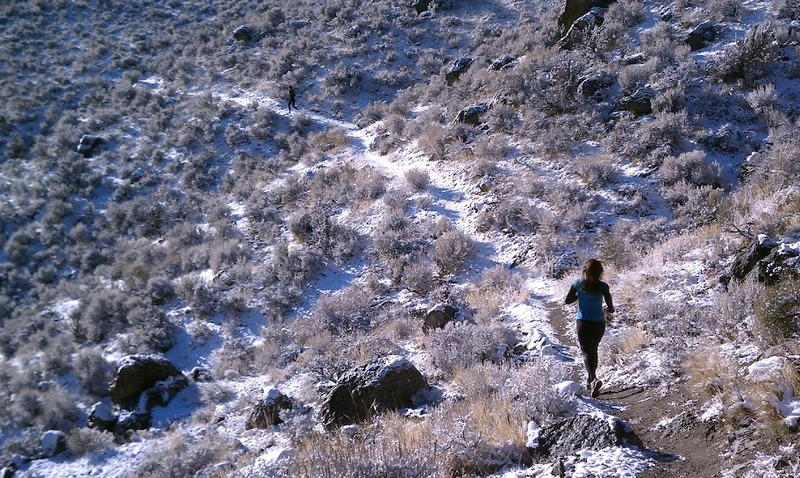 I'm sure going to try, probably somewhere down near the Fall Colors half marathon course from a couple weeks ago. Hope I see some of you out there!